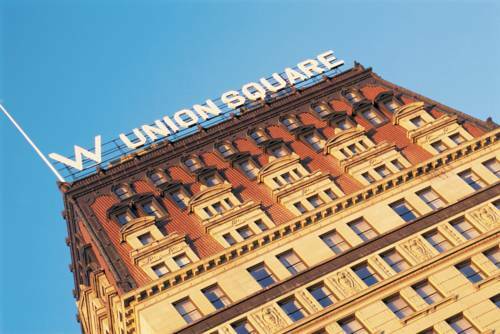 Revel in the rhythm of W New York - Union Square, located in the 1911 beaux arts Guardian Life building. Central to glamorous shopping, electric music venues and a dynamic art culture, ours is a contemporary spot for you to see and be seen.Get your heart racing at FIT, our 24-hour gym. Taste Mediterranean-inspired treats at Irvington or gaze at the city and people watch with a martini in hand in the Living Room. Be the host with the most in our 7,000 square feet of event space.Escape to your guest room to watch Manhattanites mingle from your colorful view of the square. Relax in the legendary signature W bed, and energize your morning with the Bliss Spa lemon + sage sinkside six bath amenities. W New York - Union Square is uniquely set at the intersection of uptown and downtown. Let the location energize you with its innovative culture of film, art, music and fine dining. Spend the day shopping downtown in the West Village or uptown on 5th Avenue. Explore the Green Market in the Square or relax in the greenery of Central Park. When the lights go out and the music turns up, find a late-night release in the urban playground. Mingle in the Lower East Side, sip sophisticated cocktails or see an off Broadway show in SoHo or head to the Meatpacking District for electric beats and a vibrant crowd. Grand Central Station provides high end shopping and popular tourist stops such as Rockefeller Plaza,The Today Show,and the Museum of Modern Art. Wander through the boutiques of 57th Street and Madison Avenue. The Guggenheim Museum, the Metropolitan Museum of Art, The Whitney Museum, and Central Park or take the commuter rail service to northern New York suburbs and Connecticut. Be adventurous at Chelsea Piers a sports village with six separate athletic facilities. Check out the art galleries. Relax in the sun at Bryant Park, explore the Reading Room at the magnificent Public Library, see a show in the Theater District. Along lower Fifth Avenue stop in to the Empire State Building. Also, there's Madison Square Garden and Penn Station with rail service to the North-East Corridor and commuter rail service to Long Island and New Jersey. For the meals bursting with the flavor of New York, stroll over to the lower east side neighborhoods. And via convenient car or bus service, The Hamptons, Shelter Island and vineyards of the North Fork are quick stop away. What others call a lobby, we call our W Living Room. A revolutionary open space complete with cozy seating where you can relax, and sip an evening cocktail. Gerber Group s Irvington offers a Mediterranean-influenced menu of New American classics, highlighting fresh, locally-sourced ingredients from the neighboring Union Square Greenmarket.